My wife decided, as she often does, that we should go to Preveli Bay. It has a good beach and palm trees, we had heard. I had also heard that there was a road that now went close to Preveli which started right by the taverna beside the pond and the beautiful old Venetian bridge on the road to Preveli Monastery. Well we arrived at the old Venetian bridge and took the road that went to the beach. After about 100 metres of tarmac it became a dirt road. “Are you sure you still want to go,” I asked her? We bought some water from the mini market (yes there is one there) and started to climb the steps. As we climbed, the steps themselves got steeper, higher if you like. “Are you really sure you still want to go,” I asked again? As we got to near the top of this fairly stiff climb, we came upon a narrow path that wound around the cliff side. In places you had to duck to walk under the cliff. It wasn’t easy going in the heat of the day. 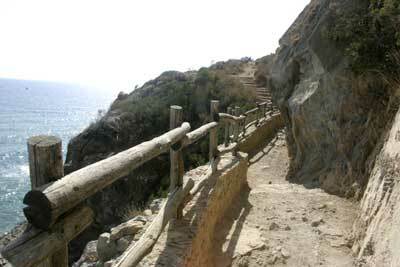 There were many more steps and steep cliff sides that looked a long way down. 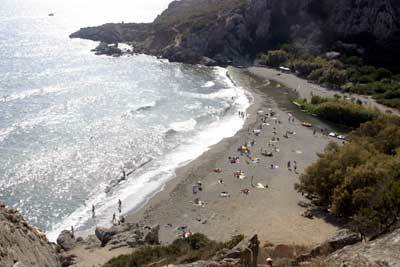 And then we came to the final edge and there beneath us was Preveli Bay. The green tinged river flowed down and across the sand and it is true, there are palm trees there. 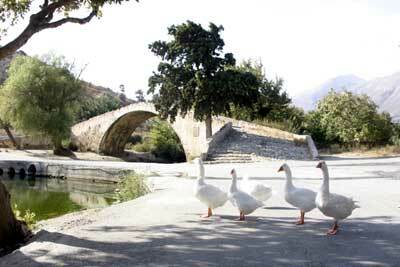 We were both quite pleased with finding Preveli Bay and so we fed the geese by the bridge on the long dusty drive home. “The Skinakas Observatory is located on the peak of Skinakas at an altitude of 1750 m., a few kilometres after Anoyia and 60 km from Heraklion. The Skinakas Observatory has been built and operates as part of a scientific research collaboration between the University of Crete, the Foundation for Research and Technology-Hellas (FORTH) and the Max-Planck-Institut for Extraterrestrische Physik of Germany. The Observatory has two telescopes: a Modified Ritchey Cretien telescope with a 1.3m aperture (focal ratio of F 7.6) and a 30cm telescope (focal ratio F 3.2). The building for the small telescope was built in 1986, and observations started in 1987. The large telescope is the largest telescope in Greece at the moment, and became operational in October 1995. The optical system was manufactured by Karl Zeiss, and the mechanical parts by DFM Engineering. Well it was some evening I have to say. We arrived after climbing the road higher and higher above Anoyia. After some kilometres we turned left onto a smaller road, not much bigger than our little car and we climbed again. Remember we must be around 5,000 feet up here. It is very high and though it was late summer – a heatwave in fact – we needed a coat to protect us from the cold wind. When we arrived we were welcomed by the small staff and shown around the two telescopes. One of them, the main one, is very big indeed and operated electrically and what is seen is displayed on a bank of computer screens. Very high tech. Problem was that it was still daylight so they suggested we return around dusk to see what can be seen. So we went down the little road and then turned left. I have to see where these roads go. On and on we went, still climbing with the huge bulk of Psiloritis (Mount Ida) to our right when we arrived at the end of the road on a small plateau. There was a half built visitor centre there. It will probably never be finished since there were so few visitors. We walked around this seemingly sanded desert plateau for a while looking for the statue built by a german girl to commemorate the resistance of Crete in the war. We didn’t find it. Perhaps next time. It is a very big plateau and there are a lot of sheep up there. So then for dinner all the way back to Anoyia – there was nowhere else to get some decent food, and back up to the observatory. Now the first time we went there were less than a dozen people there. This time the place was crawling. Cars all over the place and many many young greeks keen to see through the telescope. Unfortunately by this time, in the wonderful clear skies of Crete, the observatory was enveloped in cloud. And the cloud persisted so the staff would not open the top doors of the observatory. So we didn’t actually see anything in real time. They were mostly afraid that the telescope mirror would get wet. Ah well, we’ll go back in the spring.